Find out the difference between buying and leasing a car. You’ve probably faced this dilemma more than once when looking for a new car loan: Should I buy or lease a car? The hard part is there are so many variables to consider when deciding, it’s really difficult to make a final choice. 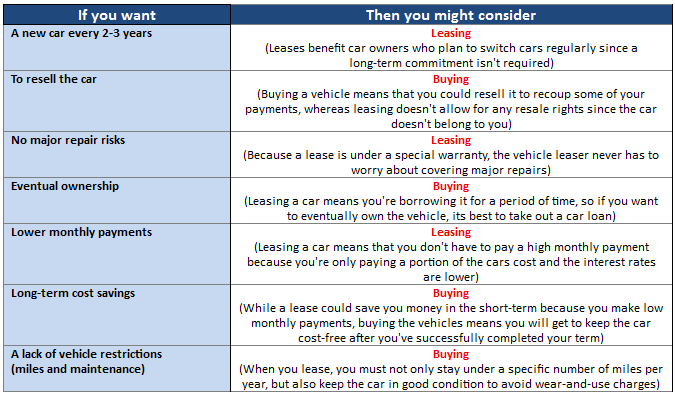 However, a choice must be made, so let’s look at the reasons why you might consider leasing versus buying a car. Deciding whether to buy or lease can be a difficult decision, so it helps to examine exactly what each means. When you buy a car, you will eventually need to pay for the entire cost of the vehicle. You will make a down payment, pay down your car loan granted by the dealer or a bank, pay the sales tax in cash (or roll it into your loan) and pay an interest rate based on your credit score. If you follow these steps, the end result will be you owning the car outright. If you lease a car, your agreement will not result in ownership — you will return the car eventually. However, in return, you are only paying a portion of the vehicle’s cost and you don’t have to make a down payment. Also, your sales tax only relates to your monthly payments (not the entire cost of the car). You will give the car back at the end of your term unless you choose to purchase it at its depreciated resale value. Suppose you want to lease a $25,000 car with an estimated resale value of $17,000. This means you will be responsible for the $8,000 difference (or depreciated value), as well as finance charges and other fees over the length of your term. However, if you want to buy the car you will pay the entire $25,000 plus those finances charges and sales tax for your state. You can use an auto loan calculator to figure out how much that would cost you each month. In addition, when your warranty expires, you will be responsible for all repairs associated with the car. For some, buying the car works best because they plan to keep it until the wheels fall off and know that they can at least sell the car at a depreciated value to recoup some of the payments. However, if you’re okay with paying monthly car notes for years with no financial gain otherwise then leasing may work for you. What About Buying a Gently Used Car? Some have found that a happy medium between auto financing and a car lease is just taking out a used car loan. The gently used vehicle offers a number of benefits. For instance, you may have the benefit of a lower down payment, lower up-front costs and a lower monthly payment. Also, you don’t have to worry about the quick depreciation of the car when its used. However, the gently used vehicle might not come with a warranty that you’re happy with because it may not still be covered by the manufacturer. As a result, you may have to purchase an extended warranty or pay out of pocket for repairs. There is a lot to consider when deciding whether to lease or go through with a car finance. Its good to know, however, that there are benefits to taking either route. Which will you choose? Q&A: How Much Is My Car Worth With a Salvage Title?